TRITON 06432 XT Or LT SNOWMOBILE TRAILER STEEL 46-inch TIE DOWN BAR WITH TRITON 02739 TIE DOWN SCREW COMES WITH ONE TIEDOWN BAR AND ONE TIEDOWN SCREW PACKAGED TOGETHER AT A SPECIAL DISCOUNTED PRICE! THE 06432 TRITON SNOWMOBILE TRAILER STEEL TIE DOWN BAR 46" MEASURES 46 INCHES IN LENGTH. PRODUCT HAS A PRE-DRILLED HOLE IN THE CENTER TO ATTACH TIE DOWNS. 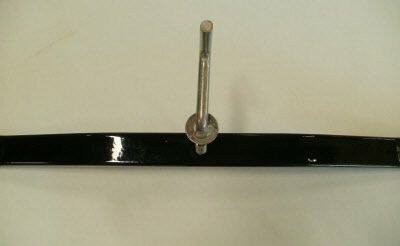 TIE DOWN BAR IS USED FOR SECURING THE FRONT OF YOUR SNOWMOBILE TO YOUR TRAILER. REPLACEMENT STEEL TIE DOWN BAR IS A 1 1/4 INCH SQUARE BAR THAT WORKS WITH ALMOST ANY TRAILER. The #02739 tie down screw is used to secure your tie down bar on your XT trailers. If you have any questions about this product by Triton, contact us by completing and submitting the form below. If you are looking for a specif part number, please include it with your message.